The 2019 Taos Electric Vehicle Expo. Saturday, August 24, 2019, Noon to 6:00 P.M.
We need volunteers, donations, and your wholehearted support. Nissan LEAF Electric Car charging in Houston, TX. This is an eVgo Network station with both Level 2 and DC fast chargers. THE 2019 TAOS ELECTRIC VEHICLE EXPO — Click Here To Sign Up and Join Us! Plan to join us. Download this image, print it, and post it where lots of people will see it. 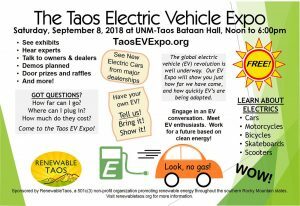 Our 2019 Taos EV Expo will be in and around Bataan Hall on Saturday, August 24th. It’s just a short walk west from Michael Hearn’s Big Barn Dance, so plan on spending time at both events. Yes, there are Teslas – and lots of other EVs — in Taos. Local EV owners will bring their Teslas, Nissan Leafs, Chevy Bolts, Mitsubishi i-MiEVs and other EVs to the 2018 Taos Electric Vehicle Expo and tell you all about their cars. Want to show off your EV? Let us know and we will reserve a space for you. 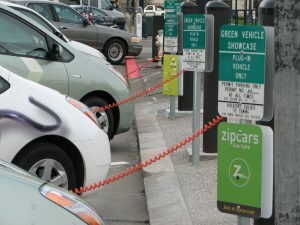 There are now many EV charging stations at private businesses in and around Taos and Taos Ski Valley. Kit Carson Electric Cooperative, The Town of Taos and others are planning to install many more stations to serve our residents’ and visitors’ needs. Come to our 2019 Taos Electric Vehicle Expo to learn more about EV charging in our immediate area and throughout northern New Mexico and southern Colorado. 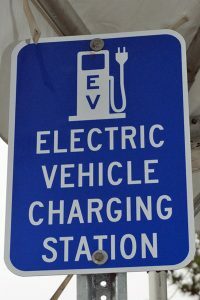 Electric Vehicle (EV) parking and charging have lots of advantages over visiting gasoline stations. 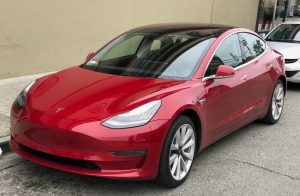 Join the EV transformation now and never pump gasoline again! 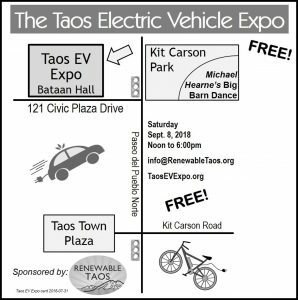 Learn more at the 2019 Taos Electric Vehicle Expo, Saturday, August 24 at Bataan Hall in downtown Taos.